A blog about art and various forms of art. Drawing, painting, sketch, portrait, pencil sketch, pencil drawing, handmade artwork by Indian artist Akshay Kumar. This is a drawing of a beautiful Indian girl face with long hair. 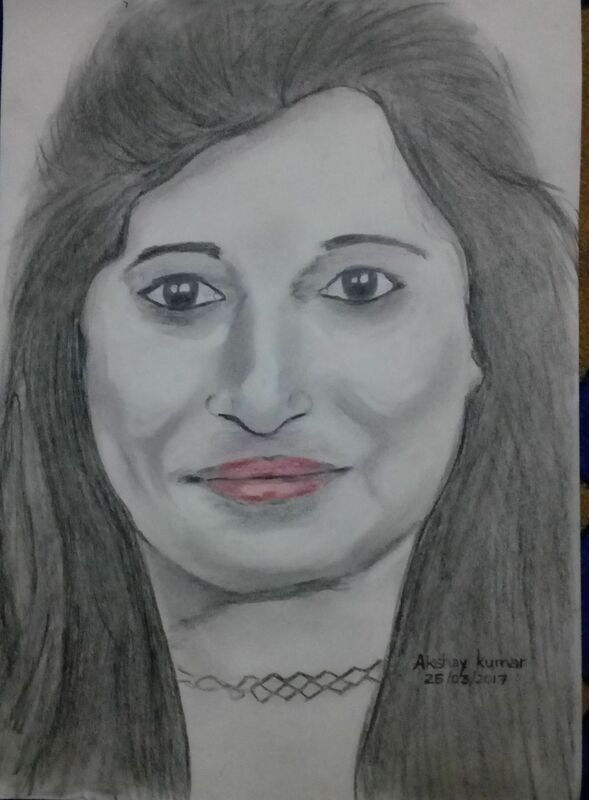 I was requested to draw this beautiful girl face drawing sketch from the photo by her mother Smt Geeta Kotian from AG office, Mumbai. Though the reference image was not clear and in high resolution, I tried my best to make it look realistic. It took me 4-5 hours to draw this. To draw this beautiful Indian girl face drawing I used 6B and HB graphite pencils for shading. Black colour Pencil for some parts of hair and eyes and little red colour pencil for lips. Feel free to request your own pencil drawing from artist Akshay Kumar. Akshay Kumar Pencil Sketches / Portraits Gallery. Drawing of a girl studying reading book on desk.